St Marys Bed and Breakfast Hotel Cumberland Island two room suite. Your suite is a delightful two-room, two-bath combination and faces south toward the St. Marys River. Bright, cheery colors envelop you in sunshine and remind you that these two rooms are your home-away-from-home. Your main guest room features a queen bed, antique pine armoire and a desk, and in the bath is a small walk-in shower; your connecting room features a lovely antique double bed and dressing table, closet and a second bath with small walk-in shower. Your guest rooms have central air and heat, ceiling fans, complimentary wireless access, hair dryers and flat screen TV’s with cable, HBO, ESPN and DVD players. 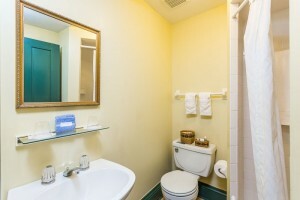 Guest rooms 195 ft² & 140 ft²; Bathrooms 30 ft² & 30 ft² ~ $245 per night for 2 guests (additional charge for extra guests in room).